Use it anywhere you’d use glass ceramic – only with more confidence. Lava™ Ultimate Restorative is a resin nano ceramic material that offers amazing esthetics, strength and unique functionality. Now available from Authorized Lava™ Milling Centers, your dental lab, CEREC®, E4D® and Straumann CARES®. Restorations made with Lava™ Ultimate Restorative must be bonded with an adhesive resin cement. 3M ESPE recommends RelyX™ Ultimate Adhesive Resin Cement with Scotchbond™ Universal Adhesive - the primer and adhesive are in one bottle. The flexibility of this system enables you to etch the tooth preparation using a self-etch, selective-etch or a total-etch technique all with one system. It's indicated for a full range of permanent adhesive, single-unit restorations. SEM images MOD Tooth #3 inlays milled on a CAD/CAM system. 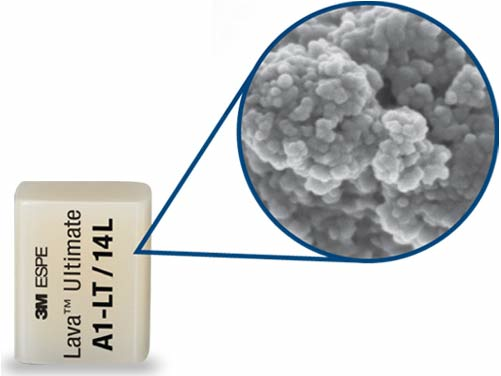 Lava™ Ultimate Restorative exhibits less chipping at restoration margins than glass ceramics including lithium disilicate.